1Don’t EVER merge into the right-turn lane in front of ATV on Piedmont too late during lunch or afternoon rush hour. Police will yell at you to “unmerge”. Talk-back & get a ticket. Think you got away? Check your rearview. She’s likely running after you. 2If you want some mid-day entertainment, watch the traffic police during lunch or afternoon rush hour to see the above lesson in action. Warning: 15 minutes will pass without you knowing. 3Spend more time getting your oatmeal or morning coffee, and finally say hello to the people you always see, but still never get to know. It’s amazing how many strangers with familiar faces there are in the place you spend so much of your life in. 4If you’re going to interact with the @ATLTechVillage Community Team, be incredibly enthusiastic because that’s the level they always bring to the table. If you’re emailing, include at least 12 exclamation points. Doesn’t matter how many sentences. 5The ATV cleaning staff is made up of some of the hardest working, friendliest folks you’ll encounter – shout out to Rossy and Crescensio. They’re likely there before you, and they’re likely there after you. Say, “hola” and “adios” more often. 6If you enter the building and exit the building via the first floor, you have the added benefit of saying good morning and good night to the security team. 7@Lane_JKL is great at creative handshakes. 8The walls are thin. Realize that your Lady Gaga and “Kiki, do you love me” on the TVs and computers can be heard during a demo to Fortune 500 leadership teams (everyone). 9When you least expect it, those damn columns in the parking deck move causing you to scrape your car. 10Feedback and help are literally next door. There’s so much brain power and creativity in your own office, I’m sure. But there’s even more when you consider all your friendly neighbors. 11After walking to and from lunch on a hot summer’s day, the best way to cool down is sitting on the couch in the mailroom. It’s always the coldest, most refreshing room in the Village. 12Don’t wait for the elevator if you’re going up or down one flight of stairs unless you’ve got a good reason. From a productivity standpoint, you’ll lose time 75% of those trips. 13I never took advantage of the roof enough during the good weather days that I then regret during the bad weather days. When the weather’s nice, go up there. 14Even though many of the hallways are whiteboards (paint), the writing tends to stay there for a long time. Don’t write something that reflects poorly on the Community, your company, and you. 16Okay, the nap room is a little weird. But when you need it, it’s the best room in the Village. 17Freestyle (verb. To travel to and acquire beverage from@ccfreestyle machine on the 1st floor next to the Community Room) whenever you can for the exercise, for the break, for the hydration, for the community. 18Post a bunch of times on the Atlanta Tech Village Slack and Forum to sell used equipment. It moves your inventory and keeps good tech amongst good tech people. ? 19Go to events as much as possible. The world is built on relationships. Those “organic” meet-ups can make the world of difference – a sales opportunity, a partnership, a creative idea to get over a problem, a friend, etc. 20To the last point, say hello to more people, and then, go beyond to find out who people are. So many strangers with familiar faces, and the world needs more authenticity. Say hello and find out what drives people. You’ll be amazed. 21The Atlanta startup ecosystem is bustling. Amazing to see folks taking the leap and dreaming big in ATL & @ATLTechVillage. Soak it all in. Rare to be around concentration energetic people who love what they do! Say hello. This is the Village, not Atlanta Tech Building. It’s common for companies in “typical” industry positions to operate much like they have operated since inception. Many industries and businesses stay closely aligned to original go-to-market strategies. Folks do not realize the opportunities afforded by fast-growing technology companies and the evolution of “best practices”. Companies with business insulation are ripe for both good and bad opportunities. The good opportunities include companies that can be made stronger and grow faster sustainably with streamlined workflows and minor tweaks to business systems. The bad opportunities (“challenges”) include the difficulties for companies to overcome the insulation. How do they learn of opportunities, let alone implement them? Think: change management is the number 1 driver of failed implementations. Excuses from “That’s just how we’ve always done business” to “Things are going well, let’s not rock the boat”. Working so deep in the day-to-date that leaders are unable to pull up for a more strategic view. They’re unable to steer away from risks and steer towards opportunistic endeavors. Hiring the same type of candidates repeatedly creating a homogenous workforce and culture. A team led by distrustful executives playing political chess. Lack of deliberate time for learning from current and outside industries. Of course, business insulation has the benefit of keeping companies squarely focused on what they’re good at. That can be a type of long-term strategy. However, over time, these strategies turn companies into highly niche offerings that take the company from long-term sustainability to short-term rewards. What elements are contributing to business insulation where you are? How are you contributing to the insulation? How are you tearing down insulation? I know a few folks who are diving into new ideas. 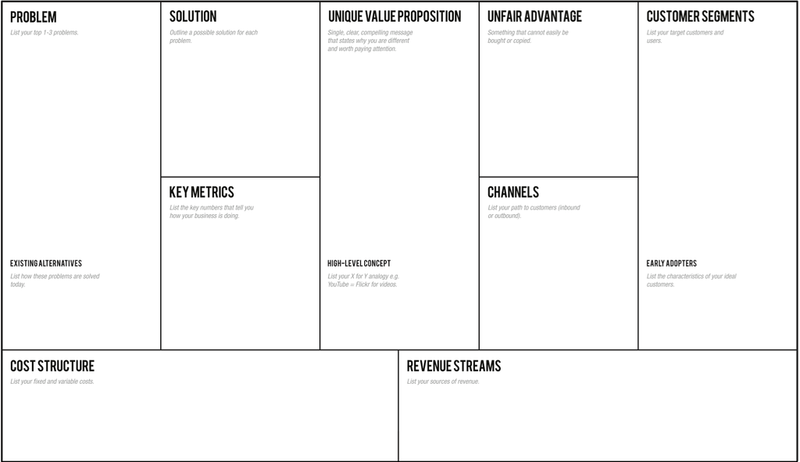 One way of starting up has been fleshing out the Lean Canvas — a simple one-pager in lieu of a business plan. Like a business plan, the Lean Canvas helps folks capture the key elements of a business without building out a detailed, largely never-to-be-used-again business plan. It’s certainly a good way to get started while thinking holistically. Another method I’ve been thinking about after reviewing “landing page how-to’s“(see Julian’s Landing Pages handbook) is what I’ll refer to as the Alternatives-Value-Personas (AVP) framework. This is a stripped-down version of a Lean Canvas. In fact, this may be a preceding model before the Canvas. In this framework, the idea is to dig into the pain today — what exists — and describe the value of a proposed solution as well as the people involved. Why I bring this up as another option is to understand the problem and the people greater while having a hypothesis of the value of the solution. The most important facet of starting out a business is the market and the pain. Is there a pain at all? What exists solving the pain, or even contributing to the pain? Another option for folks is building on a Simplified One-Page Strategic Plan as David Cummings calls it. This is an outline layout of the key aspects of the business. You’ll recognize here, too, the template has specific sections for values, purpose, promise — cultural elements. There are a lot of different options to get started. However, the most important piece is understanding the audience and addressing real pain, or as one VC describes “hair on fire“. What’s Your Periodic Life Check? Where do you want to go? Where are you now? Are you getting to where you want to go? These are questions I’ve been fielding recently. However, these are questions that should be periodically asked and answered. More than likely, myself and many others ask these questions only when things are bad. That is, thoughts arise like, “I don’t like where I am, what should I do next?” It’s akin to reevaluating bad habits or poor exercise form only when pain occurs. Even less often is when longer-term questions are asked. We should ask ourselves several times a year where do we want to go. Has this changed since the last time we asked? Why? The difficult part of not asking these questions periodically, then, comes when we have to ask the question not out of a want and simply to stay aligned. Instead, the difficulty comes when the change must come out of necessity – when a drastic change must occur. The difficulty comes when we find ourselves further beyond our locus of control. The difficulty comes when things have become easy or comfortable, and we’ve adopted a higher luxury. That’s when lethargy comes in and we forget about our why. Ask yourself: Where do I want to go? Where am I now? Am I getting to where I want to go? If not, how do I get back on-track? http://www.daryllu.com/wp-content/uploads/2018/10/entrepreneurial-ninja_logo_sm.png 0 0 Daryl Lu http://www.daryllu.com/wp-content/uploads/2018/10/entrepreneurial-ninja_logo_sm.png Daryl Lu2018-07-11 10:23:002018-07-11 10:23:00What’s Your Periodic Life Check? Tip: if you want to change jobs, roles, careers, think about what you want in the grander picture (“vision”), and why your current situation is not fulfilling that vision. Don’t focus only on why you’re not “happy”. There are a lot of folks who are curious of new jobs, new companies, etc. They usually have the same reasons for wanting to leave. At least, for many of the folks I meet with who want to join a startup from a large company. The last several folks I’ve met with work at large enterprises. Each shared almost the same reasons for wanting to leave – they didn’t feel valued, and they wanted to work in a smaller company where their work mattered. Except, companies (big or small, established or startup) are all different. They differ in their cultures. True many big companies come with much structure – multiple layers. Then again, so, too, could small companies have layers. Small companies can be directed by very strong founders who have sole discretion of direction and product. Meanwhile, adding members to the Board due to a funding event will change the expectations and execution for a young company. Many of these are outside of the control of an employee. There should be more focus on the position today. There’s a lot to learn in every position even the role someone may be in for the last 5 years. Too often, folks focus on the bad while missing the good – what is learned and what can be learned in a current situation. By focusing on the bad, folks go searching for new roles with a short-term view to “alleviate” the bad of a current position. This can lead to consistent change and unsatisfied work. Go beyond short-term objectives and take a look at the long-term view of goals and objectives. Steve Jobs famously said in a Stanford commencement speech, “You can’t connect the dots looking forward; you can only connect them looking backwards. You have to trust that the dots will somehow connect in your future.” This also highlights an important point in that each decision leads to another decision which leads to many, many more. It gives freedom to take chances knowing that the dots connect but having that vision of where you want to go helps make the next dot fit closer to the trajectory you’re hoping for. Before making that next jump, even before you ever feel “unhappy”, evaluate what your vision is for yourself. Then, evaluate how each position/ jump/ dot fits into the vision including where you stand today. Back to talking about product! Last week, I talked about the importance of product prioritization and the product roadmap. I’ve also shared takeaways from Des Traynor of Intercom talk on product development. Specifically, how to drive adoption and engagement. Today, here’s a framework for product prioritization – RICE. Reach – How many customers or prospects would a feature/ development engage? Impact – What is the outcome/ results of a build? Would this drive engagement – feature/ user adoption? Drive revenue? Confidence – How likely would development have the effect on reach and impact? Effort – How many total man-hours/ weeks/ months would this development take? Remember to include hours for each resource across functions (i.e. product, front-end, back-end). Intercom suggests teams add bands of scores to quantify each factor as best as possible. For example, to understand the factor of Impact, scoring can follow: “3 for ‘massive impact’, 2 for ‘high’, 1 for ‘medium’, 0.5 for ‘low’, and finally 0.25 for ‘minimal’”. The idea of RICE is to measure each potential development (feature, build) objectively to drive the most value – benefit vs. resources. 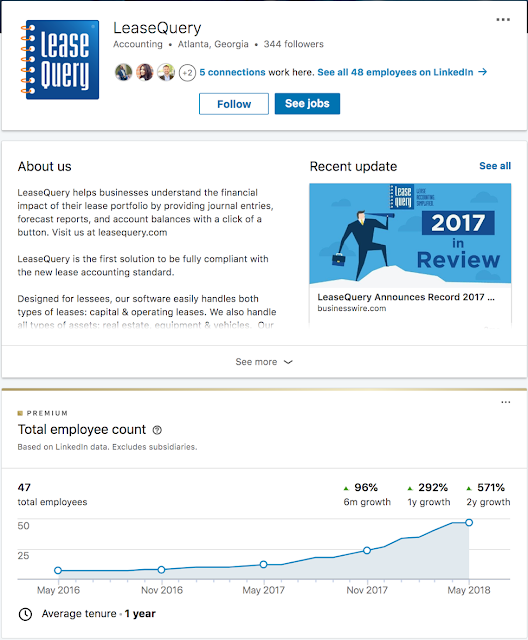 Today, I’m spotlighting two Atlanta-based SaaS startups that are on a tear in growth – LeaseQuery and OneTrust. Both of these companies have experienced monumental growth by addressing excruciatingpains. In fact, those pains are brought about by regulations forcing companies big and small, near and far to address. LeaseQuery is addressing the upcoming FASB 842 and IFRS 16 regulations where companies must now disclose its leases on the balance sheet. Before, companies could just lump leases as lease expenses, never actually disclosing what the leases were. All public companies are to report leased assets (e.g. real estate, vehicles, ovens, etc.) starting in 2019. Private companies must start recording in 2020. OneTrust’s rise has been further pronounced after it’s more public position in enabling companies to manage data privacy. Facebook’s recent handling of user data that was scooped by Cambridge Analytica was an example of user privacy being a hot topic. 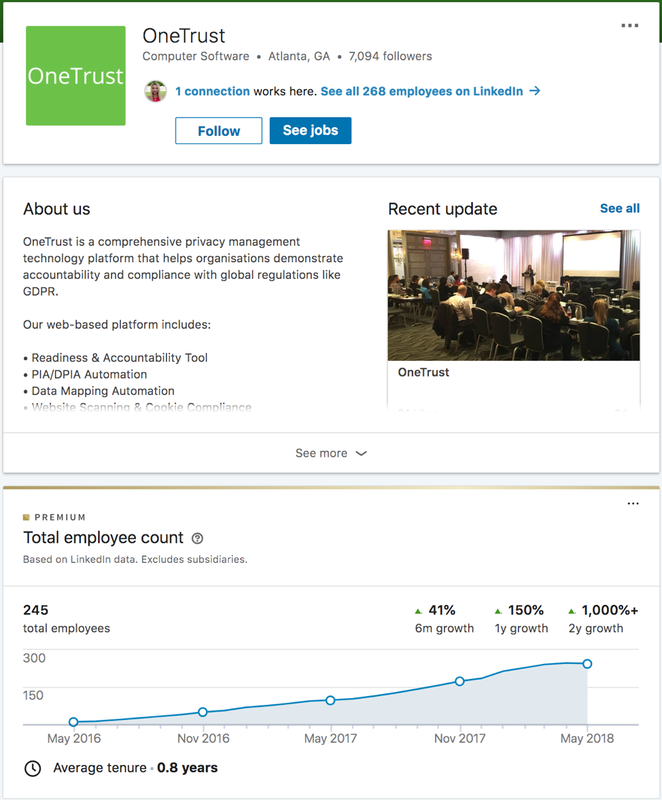 Europe’s newest crackdown on how people’s data is stored by corporations called General Data Protection Regulation (GDPR) has helped accelerate OneTrust’s significant growth. GDPR goes into effect May 25, 2018 affecting any company with any data of the European Union’s population – sold customers or not. This regulation will influence data protection guidelines worldwide with significant fines for any (and each) infraction of companies violating GDPR. These companies were started by founders not only experiencing the pains themselves, but by founders who saw the emerging trends worldwide. By moving swiftly to address these pains, they’ve been able to learn and leverage that growth for even faster growth. It’s a beautiful thing to watch companies addressing real pains scale. What are some other companies that have addressed legal and regulatory changes? Are there changes you know about in your area/ industry of expertise that have not been addressed yet (or minimally)? Desire for achievement is best demonstrated during in the “interims”. What happens during interims have the greatest influence on results. When a bodybuilder is working out in the gym. When a marketer launching or in the middle of a campaign push. When a singer is on stage. An interim then, is the in-between period between workouts at the gym, marketing campaigns, or on-stage during concerts. Interims are when desire shines greatest. This is where success is created. I thought about this as I was leaving the gym the other day. As I left, I saw folks who had just arrived sitting on a couch. Clearly, they were waiting for others. If they sit there for 5-10 minutes, that’s 5-10 minutes they could have spent warming up. That’s 5-10 minutes they could have put their things away in the locker room. This, of course, does not include the time at home with diets, sleep, etc. However, the details during interims including those immediately leading up to a new event are just as telling. When a woman with an idea says she wants to leave her job and start her own business, but spends hours sitting in front of the TV after work, she’s not building towards her goal. Her interim time is spent watching TV, not on customer discovery. She’s not learning how to program. She’s not performing customer discovery. Contrast the actions of Cristiano Ronaldo, five-time Ballons d’Or and Real Madrid stalwart. Cristiano is a well-known fanatic about his post-game recovery and pre-game preparation – the meals he consumes, recovery rituals, etc. Jeff Bezos, CEO and founder of Amazon.com, is another prime example of an individual who excels during interims. The actions of individuals during interims can be a type of “bias towards action”, but it goes beyond that. It’s a reflection of the desire and action to achieve. The habits during the interims create long-term effects beyond the events themselves in reaching goals. What are you doing during your interims? Why? “Coaching members out.” I heard this phrase a few months ago as a euphemism for firing or terminating. I thought it was a good way of sharing how leadership and managers ensure smooth transitions out of a company, beyond just “getting rid of an employee”. Then, I heard a twist to the phrase – “coaching themselves out”. In this case, it’s the member of an organization who is removing him/ herself by subtle environmental/ cultural cues. This doesn’t necessarily mean a company is ostracizing a team member, or otherwise explicitly motivating a team member to leave. That’s bad. I heard this phrase from a company who was recently voted as one of the best companies to work for. Folks here coach themselves out because they feel they are the “wrong fit”. Their values, ambitions, and the like do not align with that of the company’s. The company is enthusiastic about living out the mission and values. Here, team members are encouraged to speak up to other team members when they are not living up to the mission and values. Being so vocal and explicit about mission and values entrenches folks who believe and follow the prerogative. On the other hand, such explicit faith means those who do not align eventually leave on their own accord. Culture begets culture.